CLEARFIELD – A new year can bring many things. Continental Carbonic Products Inc. has new career opportunities for the community. David Schultz, plant manager, is looking for employees for the dry ice plant that opened in Clearfield in December. “We have a few more openings on the day shift for team members to process the dry ice,” he shared. Continental Carbonic is the largest manufacturer of dry ice in North America, he explained. The Clearfield plant is its 14th facility and is located the furthest east of any plant in the company. It provides products for the Northeast and Mid-Atlantic states. 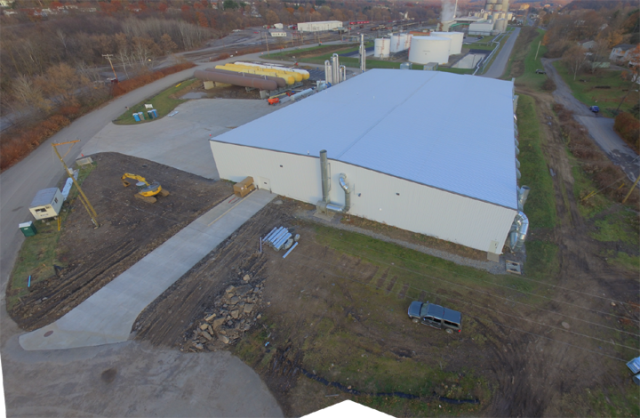 The company chose Clearfield because of the Pennsylvania Grain Processing LLC ethanol plant located in Clearfield Borough. PGP creates carbon dioxide as a bi-product of the manufacturing of ethanol and Continental Carbonic uses carbon dioxide to manufacture dry ice. “PGP is exactly the type of high quality, high integrity strategic partner we look for when we expand our business,” said John Funk, president of Continental Carbonic in a previous press release. “The partnership between PGP and Continental Carbonic Products Inc. provides another Pennsylvania made product and creates countless jobs for many Pennsylvanians, while serving multiple industries such as food-grade and medical industry sectors,” expressed Rob Swales, chief executive officer of Clearly Ahead Development. Construction on its building next to PGP began last February and was completed in November. The plant opened in December with 65 employees. “We are the newest employer in Clearfield County,” Schultz said. Schultz has been impressed by the people of the area and is confident they will be able to easily fill the open positions. “We have found a good workforce here,” he said. Applicants must be being able to work 12-hour shifts, handle repetitive motions and lift 50 to 60 pounds while twisting, reaching and bending, Schultz said. It is strenuous, he added with full-time employees working 3.5 days on and 3.5 days off. “This way they get 40 hours,” he said. Potential employees must be able to pass a drug test and background screening. Starting wage is $13.25 per hour and full-time employees are eligible for benefits such as insurance, paid vacation and a 401K program.